Launch from the Baikonur Cosmodrome; landing 30 km southeast of Arkalyk. 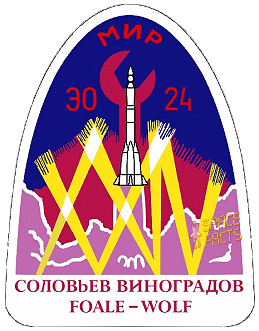 The current Mir-24 mission began when cosmonauts Commander Anatoli Soloviyov and Flight Engineer Pavel Vinogradov were launched on August 05, 1997 in Soyuz TM-26 and docked with the Mir on August 07, 1997. They returned to Earth in mid-February 1998. 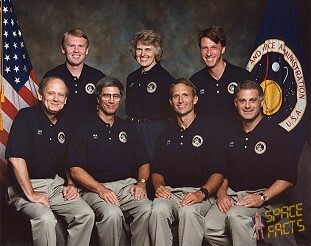 Michael Foale joined the Mir-23 crew with the May 17, 1997, docking of Atlantis during Mission STS-84. The return of Atlantis on STS-86 concluded some experiments, continued others and commenced still others. Data gained from the mission supplied insight for the planning and development of the International Space Station, Earth-based sciences of human and biological processes and the advancement of commercial technology. 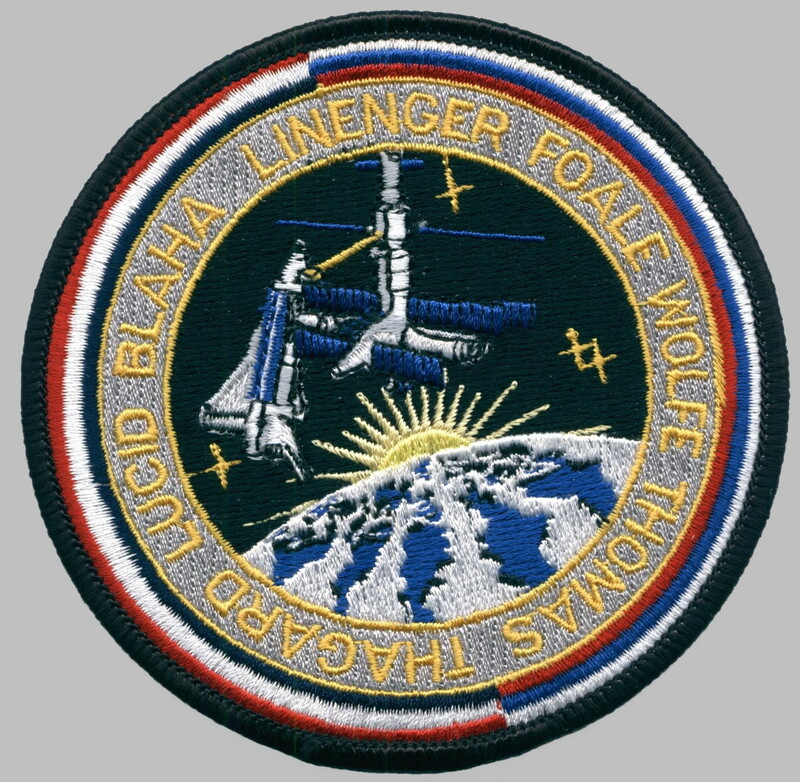 David Wolf began his stay on the orbiting Russian facility in late September with the docking of STS-86. 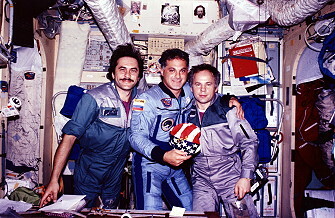 David Wolf's replacement, Andrew Thomas, became a member of the Mir-25 crew when Commander Talgat Musabayev and Flight Engineer Nikolai Budarin relieved Anatoli Soloviyov and Pavel Vinogradov in mid February 1998. Andrew Thomas returned home when Shuttle Discovery docked with Mir in June 1998. The supply ship Progress M-35 had to free the docking port (+X-axis) for the arrival of the Soyuz TM-26 and did this on August 06, 1997 at 11:44 UTC. The autonomous flight of Progress M-35 lasted until August 16, 1997. On that day Progress M-35 docked (in the automatic regime with the system Kurs) at the same docking port after the redocking of Soyuz TM-26 to the forward (-X-axis) the day before. Soyuz TM-26 docked at the aft port of Mir on August 07, 1997 at 17:02:08 UTC. The approach was in the automatic mode with the system Kurs. The hatches swung open at 18:32 UTC. Normally this is a smooth and orderly procedure but this time there were some problems with the TV-link. Cheerfully both crews met each other. TsUP and Anatoli Soloviyov discussed the conservation of the Soyuz TM-26 and some technical items. The session was concluded by the transfer of radiograms from Earth to Mir by Packet Radio. Soyuz TM-25 made a safe landing on August 14, 1997 at 12:17:10 UTC. At about 11:22 UTC Vasili Tsibliyev reported the beginning of the de-orbit burn. He reported continuously the results of the impulses in meters/sec and at 11:26 UTC he said that the de-orbit burn had stopped. He went on reporting details of the descent process and at 11:45 UTC he announced the separation of the BO (life compartment) and the instrument/motor module from the SA (descent module) in 3 minutes. This took place at 11:48 UTC just before the 3 objects entered the dense layers of the atmosphere. The BO and Instrument/motor block burnt up and the SA came in the plasma wave. Radio contact ceased and contrary to previous return flights did not come back via Altair. The Soyuz landing rockets failed to fire on touchdown, giving one of the roughest landings experienced by a returning Mir crew. 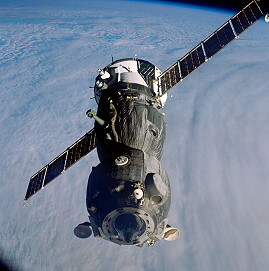 Following the departure of Soyuz TM-25, Soyuz TM-26 with the crew aboard undocked from the Kvant module at August 15, 1997 at 13:29 UTC, and redocked with the forward Mir port at 14:13 UTC. The safety clamps of the docking mechanism had been loosened and the program was proceeding according to plan. At 13:29:20 UTC Anatoli Soloviyov reported the separation and the fact that Soyuz TM-26 was slowly moving away from Mir. He steered Soyuz TM-26 in the manual mode to be able to adjust the attitude of the ship in such a way that Pavel Vinogradov and Michael Foale could make good images of the 'damage areas'. The Progress M-35 cargo ship was to redock with the Mir station at the Kvant port. The first docking attempt was called off on August 17, 1997 because wrong instructions were sent to the Progress. Meanwhile, the crew repaired the Elektron oxygen generator. Progress M-35 successfully redocked with Mir at 12:53 UTC on August 18, 1997. 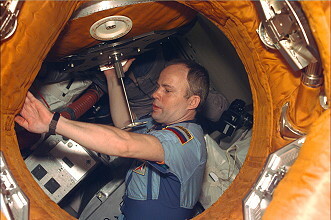 The Mir computer crashed just before the docking, and the station drifted out of attitude, causing the Progress automatic docking system to shut down; however, Commander Anatoli Soloviyov completed the docking by manual remote control. The computer was repaired by August 19, 1997. The first EVA by Anatoli Soloviyov and Pavel Vinogradov was performed on August 22, 1997 (3h 16m) inside the depressurized Spektr module (IVA), reconnecting 11 power cables from the Spektr's solar arrays to a new custom-made hatch for the Spektr. 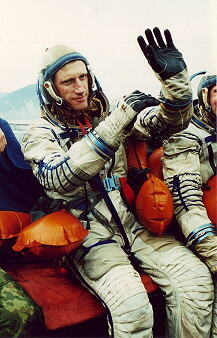 During the space walk, Michael Foale remained inside the Soyuz capsule attached to Mir, in constant communication with the cosmonauts as well as ground controllers. Pavel Vinogradov worked inside the Spektr module while Anatoli Soloviyov helped him from the transfer compartment (perekhodniy ostek), the central node where all the big modules and the Soyuz transport craft are docked. 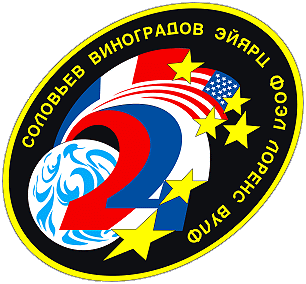 Depressurization of the transfer node had begun at 09:59 UTC, but when a leak in Pavel Vinogradov's glove was found a repressurization was ordered. He swapped the glove for a spare, following depressurization, the hatch to Spektr was opened at 11:14 UTC. By 13:00 UTC the cables had been connected to the hatch and Pavel Vinogradov began unsuccessfully searching for the hull puncture. By 14:00 UTC he was out of the module and work to seal the hatch was underway. Repressurization was completed at 15:03 UTC. Problems with Mir's primary and backup oxygen systems were quickly fixed on August 25, 1997. Power from Spektr and Kristall's solar panels resumed, but problems keeping the panels oriented towards the sun continued. On September 03, 1997 Pavel Vinogradov worked hard on the deployment of cables from the Spektr hatch to other modules and gradually he succeeded in restoring a part of the power supply for the Soloviyov Kvant2 and Kristall. The 3 undamaged solar panels of Spektr delivered power, but rotation to achieve maximum solar illumination was not yet possible. Anatoli Soloviyov struggled along to keep Elektron in Kvant1 operational and he also used power for the restoration of the Elektron in Kvant2. On August 25, 1997 Elektron in Kvant1 had shut itself off and the TGK (the solid fuel oxygen generator) did not work due to a defective firing pin. Before the outbreak of the usual press panic the cosmonauts had already repaired the TGK and Elektron in Kvant1. The power supply was partly restored in Kvant2 and Kristall: the lights are burning, the heating functions again and the drying process was going on. The second EVA by Anatoli Soloviyov and Michael Foale occurred on September 06, 1997 (6h 00m). They failed to locate any punctures in Spektr during an otherwise successful spacewalk. The spacewalkers used the Strela crane to transfer from the Kvant2 to Spektr. Anatoli Soloviyov cut away insulation to inspect the area around the radiator and solar panel mounting. Two undamaged arrays were manually repositioned to better gather solar energy, and a radiation device left previously by Jerry Linenger was retrieved. The EVA was particularly dangerous due to the risk created by Spektr's debris and sharp edges resulting from the damaged structure that could penetrate the spacesuits. Anatoli Soloviyov reported about the damages suffered by Spektr. One solar panel and some radiators were severely damaged. Support struts were broken or buckled. This old supply-ship Progress M-35 had been keeping watch at the aft (Kvant1) docking port as of August 18, 1997, the day of the redocking. Due to the well-known priorities the crew has not paid any attention to this ship until September 08, 1997. One of the first tasks of this day was the opening of the hatch and the inspection of Progress M-35's interior. The main function of the Progress M-35 was the protection of the docking mechanism of Kvant1 against the sun. The freighter has still room in which garbage and other no longer needed material can be stowed. Preparations for the opening of the hatch were going on. The crew got permission to open the hatch after the air seal checks. The hatch was opened but Anatoli Soloviyov had set this ajar for the smell which came out of the Progress M-35 was far from a 'kurort smell'. The crew however had to cease all activities with the Progress M-35 due to other concerns. On September 15, 1997 TsUP wanted to discuss the air seal check with Pavel Vinogradov. He interrupted TsUP with the statement that a few minutes ago (exactly 07:00 UTC) the Ts.V.M.-1 had shut itself down. After this report followed the usual chain reaction was: the SUD (system for movements- or attitude control) stopped and Michael Foale reported that this was also the case with the SUD in Module-D (Kvant2). Systems like SRV-U (regeneration of water from urine) and Elektron had to be switched off. TsUP gave orders to burn 3 lithium perchlorate cartridges for oxygen generation. (Anatoli Soloviyov stated repeatedly that the delivery of a new supply of those cartridges during mission STS-86 is badly needed.) Michael Foale reported that the angle of the solar panels to the sun was unfavourable, but that the complex though inclining a little bit on one side, was stable. The crew restarted the computer, but failed to find the cause of the failure. So they switched the computer off. A specialist told Pavel Vinogradov that there must be a spare Ts.M.O. on board which eventually could be used to replace the present Ts.M.O. (Central Module for Data exchange). The failure of the Ts.V.M.-1 during the redocking operation of the Progress M-35 had probably been caused by a defective Ts.M.O. In the course of the day it was obvious that the crew had everything under control and that the repair of the computer was successfully proceeding. The Mir crew moved briefly to the Soyuz transport on September 15, 1997 during a 500 m pass by the inert MSTI-2 satellite (a US SDIO satellite which operated between May and September 1994 testing infrared missile launch trackers). Space Shuttle STS-86 arrived on September 27, 1997 at the Russian space station Mir. This was the seventh of nine planned missions to Mir and the fourth one involving an exchange of U.S. astronauts. 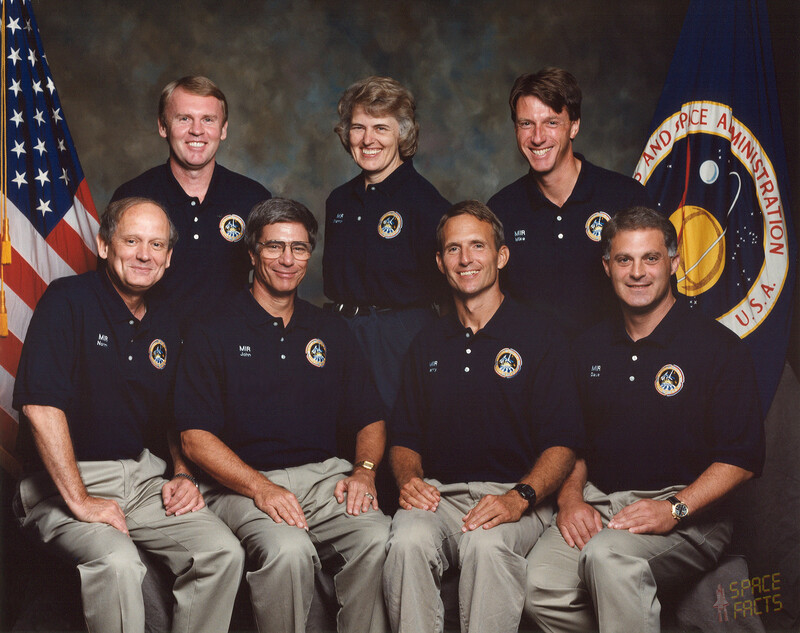 Astronaut Michael Foale, who has been on Mir since mid-May 1997, was replaced by astronaut David Wolf. He spent more than four months on the orbiting Russian facility and returned to Earth on Space Shuttle Mission STS-89 in January 1998. Atlantis again carried the SPACEHAB module in the payload bay of the orbiter. The double module configuration housed experiments to be performed by Atlantis' crew along with logistics equipment to be transferred to Mir. The docking of Atlantis and Mir took place on September 27, 1997 at 19:58 UTC, with the two mission commanders opening the spacecraft hatches at 21:45 UTC David Wolf officially joined the Mir-24 at noon UTC, September 28, 1997. At the same time, Michael Foale became a member of the STS-86 crew and began moving his personal belongings back into Atlantis. During the six days of docked operations, the joint Mir-24 and STS-86 crews transferred more than four tons of material from the SPACEHAB Double Module to Mir, including approximately 771 kilograms (1,700 lb) of water, experiment hardware for International Space Station Risk Mitigation experiments to monitor the Mir for crew health and safety, a gyrodyne, batteries, three air pressurization units with breathing air, an attitude control computer and many other logistics items. The new motion control computer replaced one that had experienced problems in recent months. The crew also moved experiment samples and hardware and an old Elektron oxygen generator to Atlantis for return to Earth. The only EVA in the STS-86 mission by Scott Parazynski and Vladimir Titov was performed on October 02, 1997 (5h 01m) for testing tools and technologies needed for the ISS and to recover Mir Environmental Effects Payload (MEEP), which were attached during Mission STS-76. Scott Parazynski and Vladimir Titov exited the upward-facing hatch in the tunnel between Atlantis' crew cabin and the Spacehab module and moved up the Docking Module to release the MEEP packages. The retrieved packages were folded and stowed in sidewall carriers in Atlantis' cargo bay, two carriers located in front of the Orbiter Docking System (ODS) and two located aft of the ODS. Within the MEEP packages, investigators were studying the effects of exposure to the space environment on a variety of materials. MEEP has been gathering data on human-made and natural space debris, capturing some debris for later study. It was attached to Mir's Docking Module during a spacewalk by two Shuttle astronauts during the STS-76 mission in March 1996. MEEP consisted of four separate experiments. The Polished Plate Micrometeoroid and Debris experiment was designed to study how often space debris hit the station, the sizes of these debris, the source of the debris, and the damage the debris would do if it hit the station. The Orbital Debris Collector experiment was designed to capture orbital debris and return them to Earth to determine what the debris are made of and their possible origins. The Passive Optical Sample Assembly I and II experiments consisted of various materials that are intended for use on the International Space Station. These materials included paint samples, glass coatings, multi-layer insulation and a variety of metallic samples. In addition to transferring the MEEP back to Atlantis, Scott Parazynski and Vladimir Titov left an item on the exterior of Mir. A solar array cap was planned to place on the damaged Spektr module on a later Russian space walk was brought out of the shuttle airlock and tethered to the exterior of the Docking Module. The solar array cap was too large to be transferred through Mir, and should need to seal off the base of the damaged array on Spektr if and when the array is jettisoned by cosmonauts. Later the leak was not discovered and the solar array cap was not used. The spacewalk continued a series of EVA Development Flight Test (EDFT) spacewalks that were conducted on six past Space Shuttle missions. The tests were designed to evaluate equipment and techniques and build experience among astronauts and ground controllers in preparation for assembly of the International Space Station. Past EDFT spacewalks had evaluated equipment ranging from the labeling to be used on the exterior of the station to the nuts and bolts to be used as connectors. In addition to retrieving the MEEP, Scott Parazynski and Vladimir Titov continued an evaluation of the Simplified Aid For EVA Rescue (SAFER), a small jet-backpack designed for use as a type of life jacket during station assembly. Originally evaluated on Shuttle mission STS-64, the SAFER was designed to be worn by astronauts during station spacewalks to allow them to fly back to the station under their own power in the event they become untethered. The SAFER unit to test on STS-86 was the first flight production model. Scott Parazynski and Vladimir Titov were wearing the devices, and, while remaining tethered and in a foot restraint, they evaluated the deployment of the hand controller and the firing of the automatic attitude hold feature. Firing the automatic attitude hold feature while the astronauts are in a foot restraint tested the firing mechanisms in the device, such as the valves and gas thrusters. The astronauts did not perform any free-flight testing of the SAFER as was performed on STS-64. Scott Parazynski and Vladimir Titov also evaluated equipment designed to be compatible for use by spacewalkers on the U.S. and Russian segments of the International Space Station. The evaluations included a Universal Foot Restraint designed to hold the boots of both U.S. and Russian spacesuits; common safety, equipment and body restraint tethers; and a common tool carrier. The Space Portable Spectroreflectometer (SPSR) was a new tool designed to measure the effects of the space environment on spacecraft materials. This was the first hand-held, battery-powered device of its kind, allowing astronauts to measure actual spacecraft devices, rather than relying on information gathered from samples. During Extravehicular Activity (EVA) operations scheduled later in 1997, cosmonauts and astronauts will use this device to measure how much energy is being absorbed by the thermal control coatings, or radiator surfaces, of the Mir space station. Radiators, which are used to shed excess heat from the spacecraft, play a vital role as part of the station's cooling system. The Interferometer to study Protein Crystal Growth (IPCG) - flying for the first time on STS-86 and the NASA 6 mission - was an instrument designed to yield valuable preliminary data on how protein crystal growth differs in the microgravity environment of space. Researchers also hoped to develop technologies and methods to improve the protein crystal growth process, which may help unlock future answers to the molecular structure of targeted proteins, leading to the development of new, disease-fighting drugs. The IPCG hardware was transported to the Mir on STS-86 and installed in the microgravity glovebox for experiment operations. Once installed, the interferometer, an instrument for measuring wavelengths of light, collected and stored optical information on a growing crystal in the facility, showing growth in form and structure, as well as in change in concentration of the protein solution surrounding the crystal. A total of three experiments were conducted on six fluid systems. The IPCG hardware was removed from the glovebox and returned to stowage at the completion of the experiments and returned on STS-89. The Commercial Protein Crystal Growth (CPCG) payload was comprised of a Commercial Refrigerator/Incubator Module (CRIM) designed as a generic carrier, and the Commercial Vapor Diffusion Apparatus (CVDA) experiment. The primary objective of the CVDA experiment was to produce large, high-quality crystals of selected proteins under controlled conditions in microgravity. Crystals of sufficient size and suitable quality are essential for protein crystallographic analysis of molecular structures via X-ray diffraction and computer modeling. The vapor diffusion method of protein crystal growth is a technique by which protein crystallization is initiated through change in protein/precipitant concentrations. Water vapor is transported from a droplet protein/precipitant solution at a given pH to a reservoir containing a relatively high concentration of precipitating agent. The process is driven by drop-reservoir vapor pressure difference in a closed volume. Typical precipitating agents are ammonium sulfate, sodium chloride, polyethylene glycol, and methyl pentane diol. The Cosmic Radiation Effects and Activation Monitor (CREAM) was used to collect data on cosmic ray energy loss spectra, neutron fluxes and induced radioactivity as a function of geomagnetic coordinates and detector location within the orbiter. Payload hardware consisted of the active cosmic ray monitor, a passive scintillation crystal canister, two neutron spectrometers and 10 passive detector packages. The active monitor was used to obtain real-time spectral data, while the passive monitors obtained data integrated over the mission duration. An additional control passive detector package was used for obtaining background data prior to launch. The Cell Culture Module-A (CCM-A) payload was formerly known as the Space Tissue Loss / National Institutes of Health- Cells Configuration A. The payload objectives were to validate models for muscle, bone and endothelial cell biochemical and functional loss induced by microgravity stress; to evaluate cytoskeleton, metabolism, membrane integrity and protease activity in target cells; and to test tissue loss pharmaceuticals for efficacy. The experiment unit fitted into a single standard middeck locker that has a modified locker door with its panels removed. The unit took in and vented air to the cabin via the front panel. The experiment was powered and functions continuously from pre-launch through post-landing. During the common flight, James Wetherbee and Michael Bloomfield fired small jet thrusters on Atlantis to provide data for the Mir Structural Dynamics Experiment (MISDE), which measures disturbances to space station components and its solar arrays. The shuttle backed away from Mir on October 03, 1997 through a corridor similar to that used during approach with periodic stops to "stationkeep" in order to collect data for the European laser docking sensor. Atlantis continued away from Mir until it reached a distance of 600 feet (182.9 meters) below the Mir. At this point, Atlantis began a re-approach to a distance of 240 feet (73.2 meters) while Mir maneuvered to an orientation that provides adequate viewing of the damaged areas of its Spektr module. After reaching the 240 foot (73.2 meters) range, Atlantis began a flyaround to photograph the damage from the Progress collision. Once the flyaround/photo survey activities are complete, Atlantis performed a separation burn to move to an orbit below and ahead of Mir. During the flyaround, Anatoli Soloviyov opened a pressure regulation valve twice to allow air into the Spektr module to see if STS-86 crew members could detect seepage or debris particles that could indicate the location of the breach in the damaged module's hull. The leak was not found. An attempt to undock Progress M-35 from the Kvant module on October 05, 1997 failed when a clamp was inadvertently left attaching Progress M-35 to Kvant. After clearing the problem Progress M-35 successfully undocked at 12:03 UTC on October 07, 1997. On October 08, 1997 at 17:07:40 UTC, so 7 minutes earlier than planned, Progress M-36 docked at Mir's aft docking port (+X axis). Approach and docking took place in the automatic mode by the system Kurs. Anatoli Soloviyov was ready to take over manually with TORU in case of a Kurs failure. During the operation the crew stayed in the Base Block. 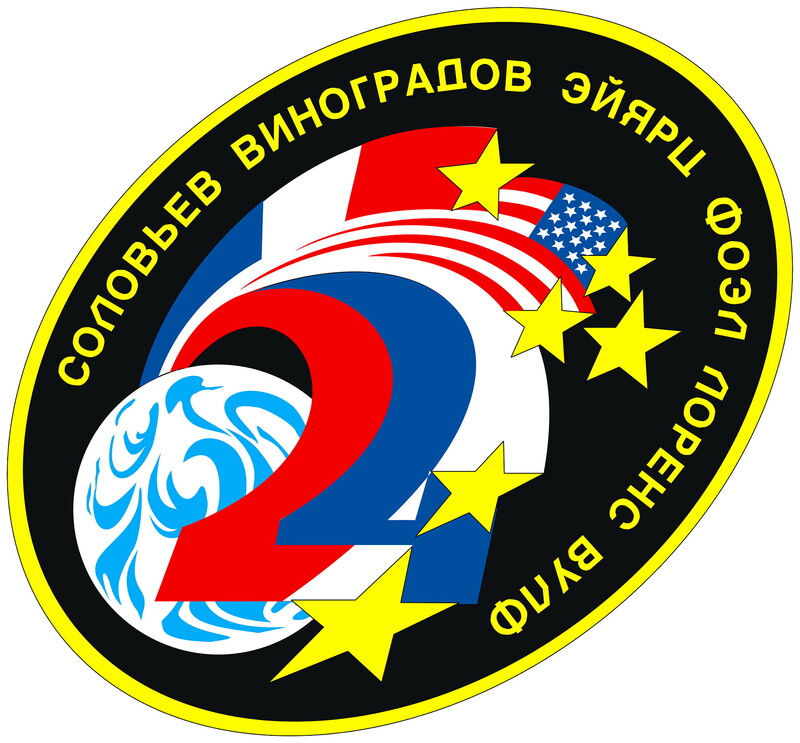 The opening of the hatches was put back until October 09, 1997 at 08:30 UTC. Thus far the crew did not spend much time for the unloading of the ship. Among the normal cargo Progress M-36 delivered the spare SUD (attitude control) computer, the mini-sputnik-1 and the German/Russian satellite Inspector. Anatoli Soloviyov and Michael Vinogradov performed the third EVA, in fact an IVA, on October 20, 1997 (6h 38m). They worked inside the depressurized Mir base block transfer compartment and the damaged Spektr module to connect new cables to the Spektr module, restoring the capability to point the Spektr solar arrays. The fourth EVA by the same cosmonauts was conducted on November 03, 1997 (6h 04m). They removed an old solar panel from Kvant. The solar panel was retracted on command, removed from the Kvant module, and stowed on the exterior of the core module. The outer Kvant2 hatch did not seal correctly after the EVA, and the inner hatch was used to seal the station. The Sputnik-40 1/3-scale model of PS-1 ("Sputnik") was hand-launched during the EVA into a 383 x 391 km x 51.6 deg orbit. 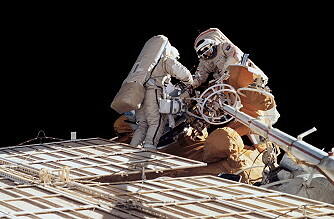 Anatoli Soloviyov and Pavel Vinogradov performed the fifth EVA on November 06, 1997 (6h 12m). 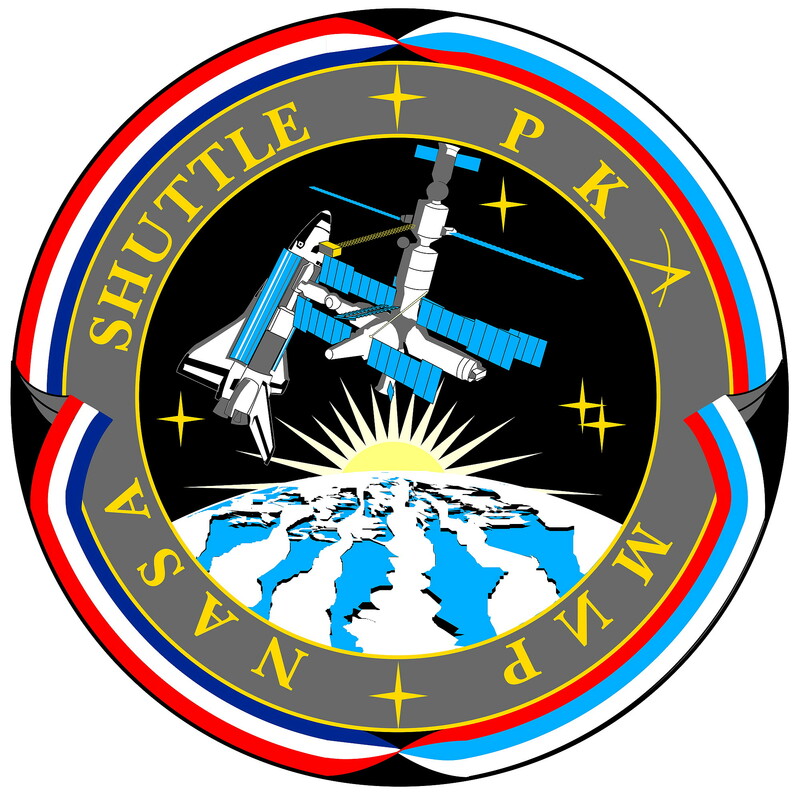 The Russian MSB-SO solar array, which has been stored on the outside of the SO module since its delivery to the station by Atlantis on mission STS-74 was installed on the Kvant module replacing the elderly MSB-4. The Kvant2 airlock hatch was thought to be sealed after the EVA, but the ShSO (Airlock special compartment) of Kvant2 was still leaking. The PNO (Instrument-science compartment), the next room in, continued to be used as the airlock until a new outer hatch seal could be delivered by the next Progress cargo ship. Back in the airlock Pavel Vinogradov inspected the rubber gasket on the outer ring of the hatch and he discovered some minor iniquities. While closing the hatch he stated that the mechanism did not react smoothly. The indicator 'hatch closed' was positive. The crew closed the hatch between the Sh.S.O. and the P.N.O. and used the last compartment as airlock. The pressure in the Sh.S.O. was 209 mm mercury. After the EVA the pressure in the rest of the complex was 637 mm mercury. Due to the problems with the airlock (S.Sh.O.) of Kvant2 David Wolf could not sleep in Kvant2's P.N.O. (Instrument- and science compartment). He moved to the Kristall module. His new 'room' was also in use for the stowage of food boxes, bags and other cargo. He had not enough time to do all his experiments and often his working day ends just before he goes to bed. He told his American friends in TsUP that there is a great difference between the time needed for work and experiments in space and the time for the same activities on earth. Interruptions during his work, for instance lunches, physical exercises, comm. sessions, replacing and moving things, sometimes triple the scheduled time for that work. His friend on earth promised to do something to enlighten his workload and to extend his possibilities to do physical exercises. These exercises are badly needed to build up the condition of David Wolf who will participate in an EVA in early December 1997. 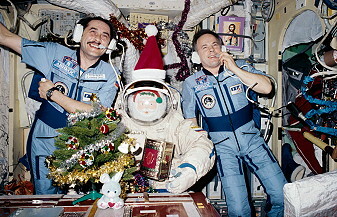 On November 21, 1997 at 21:32 UTC Mir was hit by the umptieth computer failure. This happened to be the computer which had been delivered by Shuttle Atlantis and installed during the combined flight of Atlantis and Mir in September 1997. In the night Anatoli Soloviyov and Pavel Vinogradov were on duty and during every possible pass they discussed the problems with TsUP. On the next two days a number of systems remained off to reduce power consumption. For the repair the crew used the 2nd new computer which had been brought to Mir by the freighter Progress M-36. On November 24, 1997 the computer and other systems worked flawlessly which enabled the crew to work on the sub-satellite Inspektor, still on board Progress M-36. Inspektor was launched from the departing Progress M-36 on December 17, 1997. Progress M-36 undocked from Mir on December 17, 1997 at 06:02 UTC and flew out to a range of 700 m. The X-Mir Inspector miniature satellite, built by Daimler-Benz Aerospace, was deployed at 07:35 UTC to take pictures of Mir, but its navigation system failed and it drifted away from the station. Progress M-37, launched on December 20, 1997, brought new supplies to the station, including the seal to repair the outer Kvant2 airlock hatch. Progress M-37 docked at the aft (Kvant1 +X-axis) of the complex at 10:22:14 UTC. Progress M-37 delivered the normal supplies, presents and post for the crew and a rubber gasket-ring for the repair of the hatch of the Kvant2 airlock. The crew had opened the hatches to Progress M-37 earlier than planned. On January 08, 1998 (3h 06m) Anatoli Soloviyov and Pavel Vinogradov went out the space station for the sixth spacewalk to recover some equipment and begin repairs to the leaking Kvant2 airlock hatch. They discovered a bolt on the hatch was not tight, causing a 10 mm gap. Following the repair the hatch was still leaking slightly. Anatoli Soloviyov and the new Research Cosmonaut David Wolf (had replaced Michael Foale) performed the final EVA on January 14, 1998 (3h 52m) to inspect the station interior. The inspection with the American photo-reflectometer was restricted to the outer surface of Module-D (Kvant2) and that of the Base Block was cancelled. In that way Anatoli Soloviyov got extra time to work on the defective bolting of the outer hatch. Outside they installed a camera for the observation of their activities. The images were transmitted to Pavel Vinogradov who was inside the complex to assist and observe his comrades. Pavel Vinogradov could see the images on a screen and now and then he downlinked these images via Altair-2. The performance of that camera did not fully come up to the expectations due to some 'communication' problems. Not all went as wished with the spectrometer. The spectrometer had to be installed temporarily at different locations and sometimes it was difficult to do this due to a lack of space between handrails and the surface. Handling the instrument and the reading of data were also very difficult. 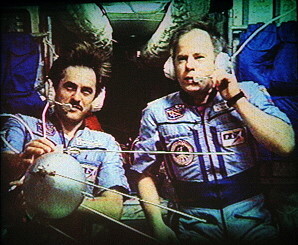 During the weekend of January 17, 1998 Anatoli Soloviyov and Pavel Vinogradov entered the airlock (Sh.S.O.) of the Module-D (Kvant2) and showed images of the outer hatch and its malfunctioning locks. One of those locks was seriously damaged. The repair of this hatch will be done by the next crew for a special spanner is needed which has to be made on earth and delivered to Mir by that crew. The Russians can work inside the Sh.S.O. not wearing a space suit for the air in the Sh.S.O. is leaking away very slowly. STS-89 arrived on January 24, 1998 at Mir. 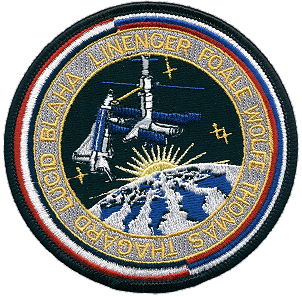 This was the eighth of nine planned missions to Mir and the fifth one involving an exchange of U.S. astronauts. 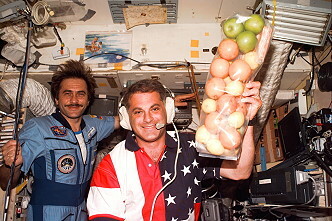 Astronaut David Wolf, who has been on Mir since late September 1997, was replaced by Astronaut Andrew Thomas who spent approximately 4 months on the orbiting Russian facility before returning to Earth when Endeavour docks to Mir in late May during STS-91. The docking of Endeavour and Mir took place on January 24, 1998 at 20:14 UTC. With the two commanders opening the spacecraft hatches Andrew Thomas officially joined the Mir-25 crew. At the same time, David Wolf became a member of the STS-89 crew and began moving his personal belongings back into Endeavour. Endeavour again carried the SPACEHAB module in the payload bay of the orbiter. The double module configuration housed experiments to be performed by Endeavour's crew along with logistics equipment to be transferred to Mir. During the mission, more than 3,175 kilograms (7,000 lb) of experiments, supplies and hardware were transferred between the two spacecraft. The Endeavour brought supplies and equipment to the Mir (i.e. two computers, a cooling system and a compressor). During the docked phase of STS-89, astronauts and cosmonauts transferred from the Mir space station to the Shuttle the science samples collected by the Mir-24/NASA 6 crew. After return to Earth, the samples were analyzed by researchers on the ground. The Shuttle crew also transferred hardware and supplies to Mir in support of the health and well being of the Mir-25/NASA 7 crew, station maintenance, and future investigations on the Mir. This research focused on 27 studies in the areas of advanced technology, Earth sciences, human life sciences, microgravity research, and ISS risk mitigation. The STS-89 Mir-docking mission transported the ASTROCULTURE flight unit to orbit. Once the Shuttle had docked with Mir, the facility was transferred to the Russian space station to begin an 80- day experiment to determine if wheat plants will produce seed in microgravity. The ASTROCULTURE unit has flown on five previous Shuttle flights - USML-1, USML-2 and the SPACEHAB 1, 2 and 3 missions - to validate the performance of plant growth technologies in the unique environment of space. Each of the flight experiments has involved the incremental addition of important subsystems required to provide the necessary environmental control for plant growth. During these flights, lighting, temperature, humidity, nutrient composition and supply, and carbon dioxide and atmospheric contaminant control subsystems were successfully evaluated. The Mir experiment was the first long-term test of ASTROCULTURE. Gaseous Nitrogen Dewar: Frozen protein samples were transported to the Russian Mir Space Station in a Gaseous Nitrogen Dewar on STS-89. This investigation was expected to contribute to the understanding of why it is possible for researchers to grow larger and more perfectly formed protein crystals in the microgravity environment of space than on Earth. 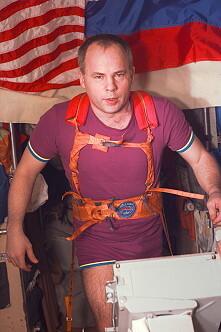 Andrew Thomas thought his Sokol pressure suit did not fit, and the crew exchange was allowed to proceed only after David Wolfs suit was adjusted to fit Andrew Thomas. Once on Mir, Andrew Thomas was able to make adequate adjustments to his own suit (which would be worn should the crew need to return to Earth in the Soyuz capsule) and this remained on Mir with him. The shuttle STS-89 backed away on January 29, 1998 through a corridor similar to that used during approach until it reached a distance of approximately 240 feet (73.2 meters) below the Mir. Pilot Joe Edwards then performed a flyaround of the station before a final maneuvering burn is performed and Endeavour departed the vicinity of the station. 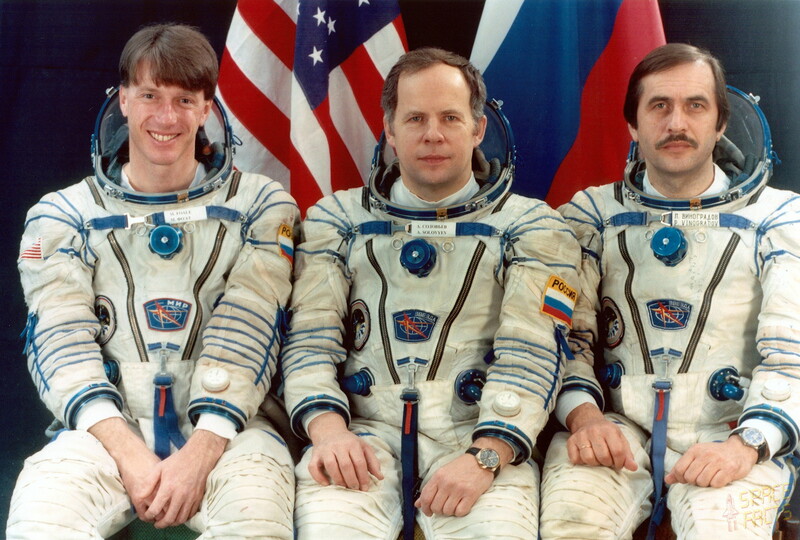 Soyuz TM-27, launched on January 29, 1998, carried the Mir crew and French astronaut Léopold Eyharts. 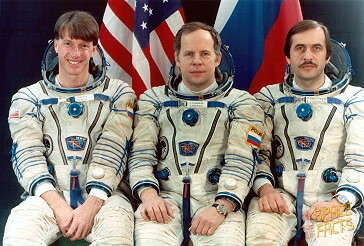 NASA and the Russian Space Agency had hoped Soyuz TM-27 could dock with Mir while Endeavour was still there, resulting in an on-board crew of 13, a record which would have stood for years or decades. But the French vetoed this, saying the commotion and time wasted would ruin Léopold Eyharts Pegase experimental program. Soyuz TM-27 docked at the Kvant module port at 17:54 UTC on January 31, 1998, less than five hours before Endeavour landed in Florida. 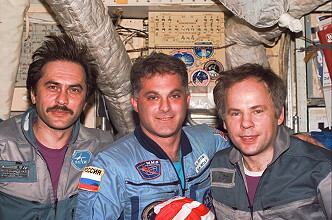 Anatoli Soloviyov and Pavel Vinogradov together with Léopold Eyharts undocked from the -X port on Mir at 05:52 UTC on February 19, 1997 aboard Soyuz TM-26. The spacecraft fired its deorbit engines at 08:16 UTC and the craft landed in Kazakhstan. Last update on April 03, 2019.